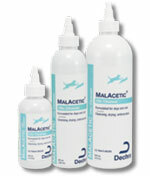 You are buying the Dechra MalAcetic Otic Cleanser For Cats And Dogs 8oz Each, model #8APW. At ADW Diabetes, we offer a wide selection of Dechra products for cats and dogs. Trust ADW Diabetes for all of your pet grooming and health care needs. The Dechra MalAcetic Otic Cleanser For Cats And Dogs 8oz Each is for support of healthy skin for animals with bacterial and/or fungal skin conditions. Patented formula for dogs and cats. Exclusive, patented acetic and boric acid base.